The technique of crystal programming was very common in Atlantis. 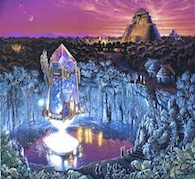 The ancient Lemurian people were able to program crystals, but in Atlantis crystals were used for different purposes. More and more crystals of this time are now being found. All knowledge about Atlantis is collected and stored in crystals. The destruction of Atlantis is certain to be caused by abuse of crystal energy. The crystal that destroyed it is likely to lie on a sea-bottom somewhere around the Bermuda Triangle. This high-energy crystal reacts to specific frequencies that arise with certain coincidences of circumstances. Cosmic events can now activate the crystal. This high frequency attunement connects you to the energies of the crystal and the knowledge that it contains. You can gain access to the Hall of knowledge when working with this energy. If you would like, you may fill a crystal such as quartz or amethyst with Atlantis energies.